Beginning with a gradated color wash over a simple raw umber block that was already dry, I managed to finish the final layer of this painting in one (long) day. 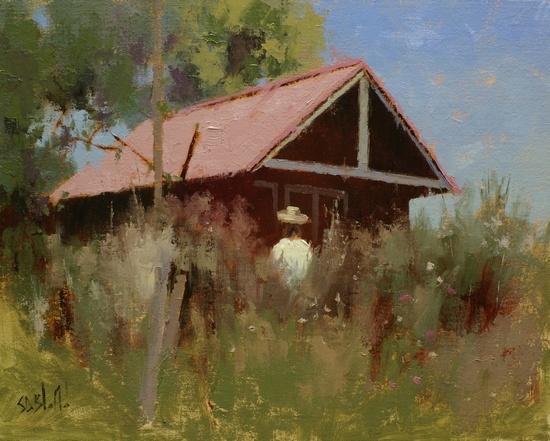 What drew my eye to this scene was the contrast of textures in the foreground against the smooth areas of the sky and shadows; the presence of the figure was more of a bonus. While I left the sky as an intense blue, I softened the colors in the trees to make them recede more into the background although I must admit that it took me a long time to figure out how to do that. I used some color variation in the dark areas to intensify the center of interest around the figure and add mystery - it's an interesting effect that I haven't tried before now.